look in the \u201ctooldocs\u201d subdirectory (or follow the \u201ctooldocs\u201d link). within a Javadoc comment and also start with an \u2018@\u2019 but are surrounded by curly braces. members are available outside the file, which is the client programmer\u2019s perspective. Javadoc, and viewing the resulting HTML file to see the results. documentation to learn all the different ways that you can use Javadoc. not check the hyperlinks you give it to make sure they are valid. hyperlinking to pages in the documentation tree. called out specially in the generated HTML documentation. You can have multiple author tags for a list of authors, but they must be placed consecutively. This tag allows you to indicate the version of this code that began using a particular feature. this particular type of exception can emerge from the method call. 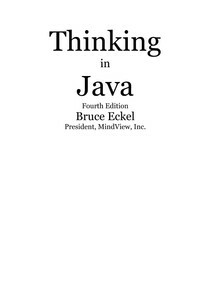 /** The first Thinking in Java example program. * Displays a string and today\u2019s date. /** Entry point to class & application.